HINCHINBROOK (AUS) (Bay 2007-Stud 2011). 2 wins at 2, AJC Skyline S., Gr.3. Leading Aust. First Season Sire 2014-15. Sire of 234 rnrs, 146 wnrs, 13 SW, inc. Press Statement (BRC JJ Atkins S., Gr.1), Whispering Brook, Derryn, Seabrook, Diamond Tathagata, Beat the Clock, Salsonic, Samara Dancer, Flippant, Spright, Flying Jess, Manaya, The Virginian, SP Problem Solver, Wild Heart, Knowable, Super Too, Brazen, Brooklyn, Old Trieste, Un de Sceaux, etc. Hinchin Time (f. by Hinchinbrook). Winner. See below. Rocket Strike (g. by Stryker). Placed in 2017-18 in Aust. WHOEVER (Redoute's Choice). 3 wins at 1100m, 1200m, A$171,800, AJC Nivison H., L, STC Mad About the Hat Day H., 2d AJC Sapphire S., Gr.2, Challenge S., Gr.2, City Tatt's RC Lightning H., L, STC Thursday Night Racing in December H., 3d STC Theraces.com.au H. Producer. SILVERSTREAM (Al Maher). 9 wins-1 at 2-to 1400m, A$709,400, to 2017-18, WATC Lee Steere S., Gr.2, AJ Scahill S., Gr.3, Northerly S., Gr.3, Jungle Dawn Classic, L, Westpeed Nursery H., Seacorp H., Tabtouch H., Merrywell H., Variety at the Races H., 2d WATC La Trice Classic, Gr.3, Starstruck Classic, L, RS Crawford S., L, Birthday S., L, 3d WATC Miss Andretti S., L, 4th WATC Winterbottom S., Gr.1, La Trice Classic, Gr.3. SWEET AND SPEEDY (Street Cry). 3 wins-1 at 2-at 1200m, 1400m, A$166,975, VRC Vanity S., Gr.3, MRC Ian Miller H., 3d SAJC National S., Gr.3. Cool and Neat. Winner at 1400m in 2016-17, HKJC Macau-Taipa Bridge H., 2d HKJC BMW Centenary H., Nanjing H.
CALANDA (Snitzel). 6 wins at 1100m, 1200m, A$545,450, to 2017-18, Clarence River JC Ramornie H., L, Gosford RC Takeover Target H., L, ATC Inglis Sprint, Schweppes H., Bowermans Office H., Schweppes P., 2d BRC George Moore S., Gr.3, 3d ATC Membership H., 4th ATC Razor Sharp H., L, VRC Mss Security Sprint H., L.
Big Bear Rock. 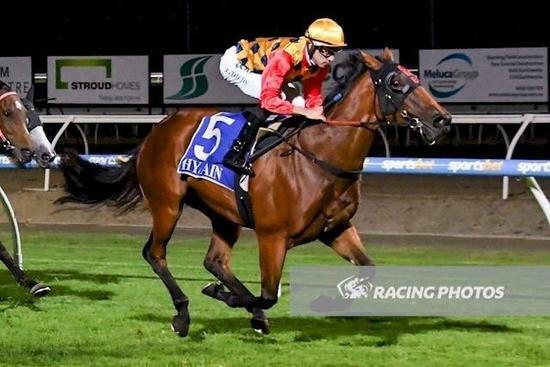 4 wins to 1200m, A$110,830, VRC Nowicki Carbone H., MRC Ascend Sales & Sponsorship Consultancy H., 2d ATC Waverley H., MRC Sportingbet H.
Boat Quay. 3 wins to 1450m, MVRC Connex Plus H., SAJC Australian Manufacturing Workers Union P., Scott Group of Companies, 3d SAJC Sealink Travel Group H., Distinctive Homes H., VRC Sunday Herald Sun P. Producer. Mister Rockstar. 2 wins at 1000m, 1200m, SAJC John Shanahan H., 2d SAJC Drink Driving? Grow Up H., Peter Elberg Funerals P., 3d SAJC Mac Drink Driving Grow Up H., Quayclean H.
Vaz de Torres. 6 wins from 1300m to 1650m, A$109,400, BRC Aitkenvale Family Health Centre H., Ambassador Travel H., Mount Franklin P., Corona Beach Party H., 3d BRC Blackdown Accommodation H., Stradbroke Eve Calcutta H.
Danza King. 3 wins to 1550m, A$81,295, AJC Busby P., ATC Elizabeth Bay H., STC Porter's Liquor H., 2d ATC John Vincent Farewell H., 3d AJC Vaucluse 2YO H., Triton H., ATC Heckenberg H.
Stratford (Stratum). 4 wins at 1100m, 1200m, A$302,900, ATC Congratulations Lonhro H., NAB Corporate H., GCTC Magic Millions P., 2d ATC Rydges Bankstown H., 3d GCTC Magic Millions Cup, RL, ATC Sharp Fly H., 4th ATC Southern Cross H., Gr.3. Superforce (Mukaddamah). 4 wins to 1200m, A$98,600, S$4,687, MVRC Le Pine Funeral Services H., Strathayr H., VRC Heron Bridge H., 2d MVRC Symphony Facial Tissues H., 3d VATC Zeditave S., L, MVRC CGU Insurance Trophy, 4th VATC Christmas H., L.
I Love Billions. 5 wins-1 at 2-to 1300m in Macau. Winzali. 13 wins-2 at 2-to 1300m, AJC Sam Horden H., STC Alfalfa H., 4th ACT RC Black Opal S., Gr.2. Esplendido. 10 wins to 1300m in Macau, Macau Arlington Park H., Bochum H.
Minga. 3 wins at 1200m, 1300m, AJC Elusive H., STC Maroubra Seals H., 3d AJC Grey Ghost H. Producer. Celebration Bell. 2 wins. See above.